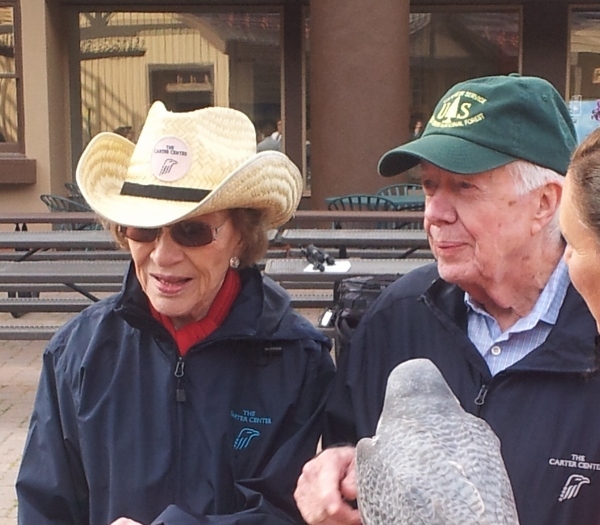 Jimmy and Rosalynn Carter in Vail this summer for a Carter Center meeting (David O. Williams photo). As Israelis and Palestinians come to final terms on an indefinite ceasefire in Gaza – a deal forged by Egypt – it’s important to remember who brokered the deal in which Egypt became the first Arab state to formally recognize Israel in September of 1978: former President Jimmy Carter. The Democrat whose very name is anathema to war-hungry conservatives was in Vail over the summer for a Carter Center confab, and I met the man who benefited most from President Gerald Ford’s pardon of embattled President Richard Nixon 40 years ago next month – a pardon that cost Vail Valley benefactor Ford reelection and swept Carter into office in November of 1976. Carter’s greatest achievement in office over the four years of his presidency was by far the Camp David Accords, which brought Israeli Prime Minister Menachem Begin together with Egyptian President Anwar Sadat to craft the framework of a peace deal that lasts to this day in a region of the world where peace is such a fleeting thing. The deal cost Sadat his life in a hail of bullets, but Egypt’s role in recognizing Israel’s right to exist cannot be understated. Now as the Arab Spring morphs into a growing regional struggle pitting jihadists but also everyday citizens seeking basic human rights against old-school, hardline dictators such as Hosni Mubarak in Egypt, Muammar Gaddafi in Libya and Bashar al-Assad in Syria, we see that it was often the brutal repression of strongmen keeping disparate ethnic and religious groups together within borders arbitrarily drawn by colonial powers after World War I. Take out the strongman, for whatever reason — the way the United States did with Saddam Hussein in Iraq and Gaddafi in Libya — and the result is a roiling maelstrom of death and destruction among Shia, Sunni, Kurdish and Christian militias. First our justification for invading Iraq in 2003 was to strip Hussein of his weapons of mass destruction, but once that was proven either a massive falsification or a colossal failure of intelligence – take your pick – the George W. Bush administration told us it was all about building democracy. The problem with democracy in the Middle East, at least as far as the U.S. is concerned, is that it often leads to leaders we don’t like, such as Nouri al-Maliki in Iraq or Hamas in what many hope will someday be an independent Palestine. In Egypt, it led to the ascendancy of the Muslim Brotherhood, which a military coup then deposed. Now we see those old hardline elements teaming with the United Arab Emirates and the brutally repressive Kingdom of Saudi Arabia – one of our greatest allies in the region – to attack jihadist militants in Libya. And the U.S., after withdrawing most of our troops in 2011 from Iraq, is gradually getting sucked back into an air war to combat the Sunni insurgency in Iraq and Syria that calls itself the Islamic State and has declared a caliphate, or Muslim state of repression. I think I was proven right on most of those points. Little did I know that we’d wind up staying indefinitely in Afghanistan after quickly taking out the Taliban and finally finding Osama bin Laden stashed away by another one of our suspect regional allies, Pakistan. And the ski industry didn’t suffer nearly as much from war and travel fears as it did five years later when the economy collapsed because of the housing-bubble burst orchestrated by the very bankers who are some of Vail’s best guests. But that’s a blog for another day. Back to Jimmy Carter. He is right when he blasts President Barack Obama and current Israeli Prime Minister Benjamin Netanyahu for failing to seriously pursue the two-state solution and curtail ongoing Israeli settlement in the Occupied Territories. That is the only way to achieve lasting peace in that region. Otherwise, no lessons will have been learned – once again – from the deaths of more than 2,000 Palestinians (500 of them children) and 64 Israeli soldiers over the last 50 days. And if Republicans retake the U.S. Senate in November and the White House in 2016 and put boots back on the ground in Iraq, nothing will have been learned from the deaths of nearly 5,000 U.S. soldiers and hundreds of thousands of Iraqis in the Iraq War. With that in mind, it’s also important to point out that U.S. Sen. Mark Udall, a well-respected moderate Democrat from Colorado facing a tight reelection in November, rightly voted against the Authorization of Use of Military Force Against Iraq Resolution of 2002 when he was in the U.S. House of Representatives. Remember that in the polling booth in November. Love Carter or hate him, he knew well that lasting peace can only come from tough diplomacy, and that military intervention needs to be the very last option on the table, not the first knee-jerk response.